Nice pasta dish! I ate it without the sausage which was good, but not as substantial as my omnivores portions. I used mock chicken broth rather than beef stock, & had somewhat less mushrooms & sausage than called for. Using the amounts given would have been better. Even so, a very pleasing & filling dish. This is a nice meal with a salad, & tastes more complex than it is to prepare (ostensibly a 30-minute meal, but it took me longer). The lamb meatballs, eaten by hubby, were declared very tasty, and the tangy tomato sauce was a nice contrast to the creamy polenta. I really like the addition of honey & rosemary to the polenta, plus milk as part of the cooking liquid. The meat-eaters in the family loved this! The variety & amount of spices used for the meat created a complex & tasty gyro. The yogurt-tahini sauce was slightly spicy but cooling. I used some ground pork to augment the too-small-amount of lamb in my larder. It was difficult to slice the gyro loaves as thinly as described & have them stay together. Did not make the chicken "gravy" for the waffle fries knowing that would not appeal to my family. The meat eaters in the family really liked this one! Lots of good flavors, especially the red cabbage. Had to substitute chicken stock for beef in the gravy, but it didn't adversely affect the flavor. supposed to be a 30 minute meal, but it took me rather longer to prepare. Relatively easy to prepare, nice flavor, but the veggie mixture didn't hold together well as patties at all. Should have followed my instinct & added an additional egg. This was just OK, probably won't make again without major tweaking. It seemed too much like just throwing a bunch of stuff in a pot & hoping it turns into something wonderful. It didn't. Even though I was dubious about chili sauce on a ham steak, hubby really like the combination. He liked the cheesy polenta more than I did--it wasn't very creamy, almost dry in texture, certainly not as it appears in the book photo; the liquid to instant polenta ratio is not correct IMHO. I substituted rice for the whole wheat noodles and bone-in pork chops for the boneless chops. The rice was especially delicious and I loved the pop of the edamame in each bite. The meat eaters in my family pronounced this very tasty; I whipped up some of the cider gravy with apples & onions for myself as well. Originally a recipe for one, but easy to expand for more people. Definitely will make again. Quick to prepare, as the recipe says. I tripled the recipe & perhaps due to my miscalculation, the sauce was not as "devilish" as promised. It also was very thin, more like broth, so I added some cornstarch to thicken. A little fussy with the prep of the chicken cutlets, but very tasty indeed. For the sake of time, I short-cutted the chicken prep a bit, just sprinkled w/ herbs & granulated garlic, no cheese, before breading. Forgot the lemon zest, had no parsley. Replaced the tomatoes in the sauce with half a jar of pasta sauce from the frig. A nice dish for Sunday supper. This tasted good, but was a kind of bland orange color. I also would have liked more veggies in it--perhaps something less orange. This was good, but not great. Something was missing; it was a rather bland dish. The amount of tomato puree seemed to not do much but turn the ricotta pink. It certainly didn't add much to the flavor. Granted, I didn't have grill seasoning, & subbed mixed herbs, and my supply of fresh basil was small, but still, the dish needs a flavor boost. Has potential. Really delicious sauce for the fish and pasta. Quite a number of steps in the prep, but it was relatively easy to prepare. Good enough for company. This is dog eared in my book. My go to anytime I'm craving a simple shrimp dish. I add a splash of white wine and chopped basil, as well. Served with crusty, warm bread ~ yum. A pleasant salad with clean, mild flavors that is a nice accompaniment to a rich main dish. It's a good use for that half-filled jar of marmalade that might be taking up space in your frig! Didn't have hearts of palm, unfortunately, or parsley. Replaced shallot with shallot salt. I love the consistency of this soup. Because the canned pumpkin is so finely processed, it’s not too viscous like a lot of squash soups I’ve had. In the 10 years since she served up her first 30-minute meal—and thousands of delectable dinners later— Rachael Ray has learned just about all there is to know about getting a great tasting meal on the table in a hurry, whether it is one of her patented 30-minute miracles or something just a tad more involved for a special gathering. 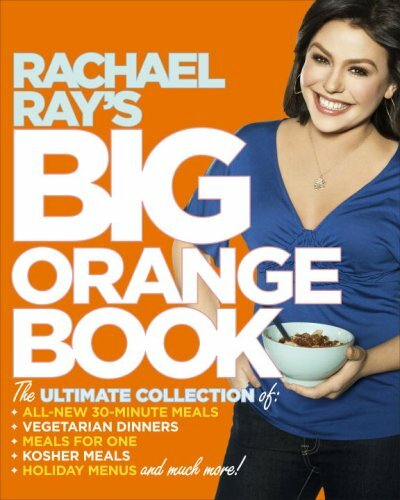 Rachael’s Big Orange Book is the ultimate resource for busy cooks. Need kitchen inspiration? It’s all here and it’s all new—and bigger than ever! Just one for dinner tonight? Forget the cold cereal. Rach has a chapter of recipes that make dining on your own a thoroughly civilized occasion, with great meals that won’t leave you with a fridge full of leftovers. Vegetarians on the guest list? No problem! Choose from dozens of meat-free meals that are every bit as satisfying as your tried-and-true standards and savory enough to please the carnivores in your crowd. Observing a Kosher menu? Check out the selection of menus just for Kosher cooks, all ready in less than, you guessed it, 30 minutes. There's even a mother lode of burger recipes for fans of the bun—so many options you could make a different burger every day for a full month! In addition to her latest 30-minute creations, Rachael has put together an array of menus and recipes for easy entertaining, from quick snacks to serve for game night and easy hors d’oeuvres, to soup-to-nuts menus for her favorite holidays and special occasions. Whip up a pasta buffet for a special mom on Mother’s Day, please a crowd with a super-simple Oscar party menu, and give thanks for not one but four fantastic menus that keep holiday stress to a minimum by getting you out of the kitchen in record time. Best of all, these recipes have all the huge flavors you’ve come to expect from Rachael, with something to please every taste—and every food budget. You’ll even find the treasured family recipes that Rachael and her husband, John, have enjoyed for years; see if they don’t become beloved family traditions in your home as well. Whether this is your first introduction to cooking the 30-minute way or you are a long-time convert, you’ll find irresistible new recipes here to make the most of every second you spend in the kitchen.